January 17, 2016 - Airbus And Uber (Uber Technologies, Inc.) have partnered to provide consumers with helicopter service using the Uber app. The service will follow Uber's current model which will allow consumers with smartphones to submit a trip request which is then routed to a helicopter service. In late May 2015, Airbus Group had announced a plan to establish its Silicon Valley operations with a fully independent venture capital fund and an innovation center, which has been branded A³ by Airbus Group. Airbus Ventures has now completed its core leadership team set-up and is operating with a $150 million commitment from Airbus Group. At the 2016 Digital-Life-Design conference in Munich, A³ CEO Tom Enders told participants that the fund’s mission is to identify and invest in the most visionary entrepreneurs in the global aerospace ecosystem. As one of its first projects, A³ is collaborating with mobility provider Uber on a market pilot to provide an on demand transportation service using Airbus Group’s H125 and H130 helicopters with a goal of proving a new business model for helicopter operators to access a broader customer base. Enders said the app will be the first step in a project that aims to “connect air transport to ground transport in an integrated way.” Uber Technologies based in San Francisco, California. It has a customer base in North, Central, and South Americas, Europe, the Middle East, Africa, and the Asia Pacific. The company was founded in 2009, as UberCab Inc. However, in 2010 the company changed its name to Uber Technologies (Uber). The company core service is to provide users who are looking for ground services (taxi services) with its Uber app which allows users to arrange and schedule transportation services with third party providers. 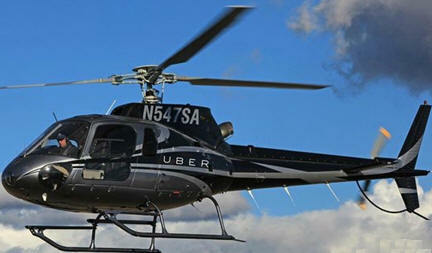 Uber had tried out this concept back in 2013, when it offered UberChopper service between Manhattan and the Hamptons and the company had also provided UberChopper service at the Cannes Film Festival in May and in June the company provided services during the Bonnaroo Music and Arts Festival in June. The cost ranged from several hundred dollars to several thousands of dollars.